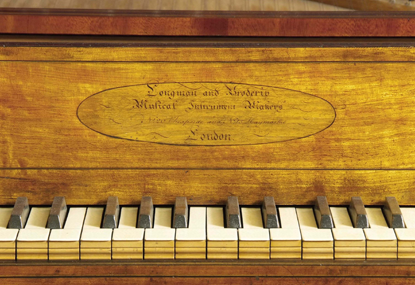 This extremely rare instrument, circa 1784, is one of the earliest surviving English Grand Pianos. The mahogany case inlaid with ebony and fruitwood lines is raised on a trestle stand with square tapering legs on wooden ball castors. It has three harpsichord style case hooks. The five octave keyboard FF-f3 has ivory naturals and ebony capped accidentals. It is bi-chord throughout with an undivided bridge. The Anglo/German action is accessed from underneath; an unusual feature found on other extant pianos by Hancock. This important very early example of a grand piano has been restored to good playing condition.